i'll be muddied and sullied. i'll slip and i'll fall. i will trip and i will tumble. i'll walk and i'll crawl. no. 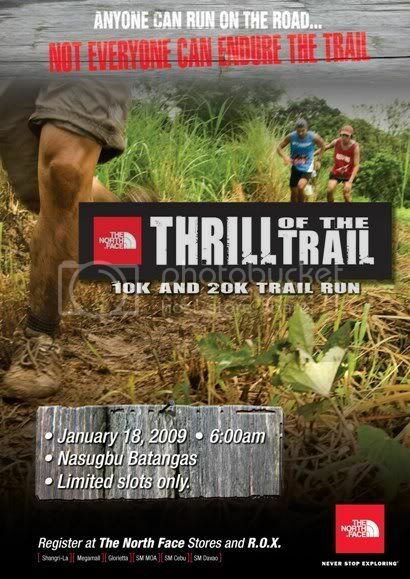 i'm not talking about life in general, but my first race for the year: the TNF thrill of the trail this january 18, where i'm registered for the 10k. i missed the first edition of the trail run sometime in the third quarter of last year, but i've been registered for this one. after hearing the stories about last year's run from friends who all got down and dirty i'm tempted to wear my hiking boots. but they're 2 stones heavy so that won't be wise. i'm no ill-equipped though for this run because i do own a number of trail runners. over the holidays i unearthed them from a grave of dust and cobwebs in my room to decide which to wear. 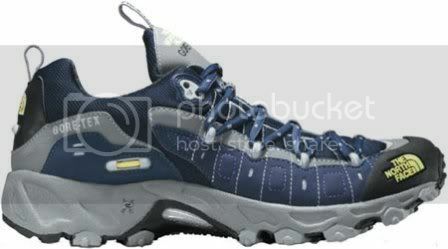 first are my blue TNF ultra gore tex XCR trail runners. i got my pair as some sort of an impulse purchase in 2004, and later even had them replaced after the sole began to show signs of deterioration even when i hardly used them. i say they were purchased on impulse because i merely liked the brand and how the pair looked but they didn't fit my feet nicely. i already got the size 11 and still my big toe was already scraping the the front end, and the toe box was a bit tight as well, that all my other toes curled uncomfortably. because of the bad fit, i rarely used the pair, particularly for my outdoor activities. many months later, i tried them on again, hoping that by some miracle, they'd be a better fit. but they'd deteriorated from non-use, and the fit is still too tight. my feet have expanded since i first bought the pair. a pity that i can't wear this pair since it would be nice to be fully garbed in TNF (prizes go to runners who wear at least one item from TNF). 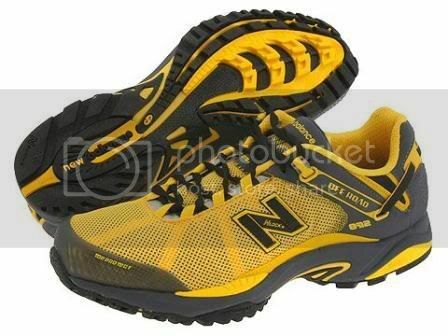 so i got another pair: yellow new balance M872 off road shoes. after that miscue with my TNF shoes, i decided to get a little extra for my toes so i got the size 12. i figured since i'd be using them for trail running, there ought to be some reasonable space inside the shoe so as to avoid nasty dead toenails. but! new balance shoes are normally 2E, so there was already sufficient space in the toe box, so now i look like a clown wearing shoes the size of boats! before i left singapore early last month, i picked these up at the terminal 2 of changi airport: red salomon XA pro 3D. they're like the nicest things to look at, and my low-arched feet are getting used to the contours of the pad. i've worn them around manila a few times and i kid you not when i say that i've noticed some "i covet thee" looks from people. 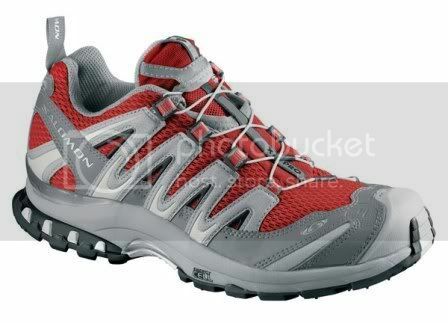 ever since adidas sold salomon to american sports, they have not been available in the philippines, and i've been wanting to get one ever since i retired my first trekking shoes which were also by salomon (they were also trail running shoes actually). but i don't think i will risk exposing such nice things to the rigors of a real run come january 18. they're too pretty for the trail. so, although i'd probably look silly on my NB M872, they win: i've tested the pair at least twice on some unpaved lots in fort bonifacio when i still worked there. all i need to do is find some nice laces and i'm all geared up.